In the Modern Age & Time, the Indian Armed Forces are truly the inheritors of this glorious lineage of brave warriors. Right from the first dawn of Independence they have assumed this colossal responsibility of providing the first line of defence for a Nation with a vast length and breadth such as ours. Faced with a perennial shortage of human resource, as well as a million inadequacies in terms of quantity & quality of material/equipment notwithstanding, our servicemen untiringly tread on the path of sacrifice & duty with unflinching devotion. We as ordinary civilians might not do much to ease their enormous burden, but at the very least we can recount the tales of devotion, sacrifice and valour and seek some inspiration from such Veers. One such Veer was Major Somnath Sharma – recipient of the first ever Param Vir Chakra, the highest gallantry award of the land- and the following is his Gaatha. Major Somnath Sharma, son of Major General Amarnath Sharma, was born on 31 January 1923, in Himachal Pradesh. He came from a well-known family, with an established background of distinguished military service.His father, Major General Amar Nath Sharma,retired as Director, Medical Services (Army)). His younger brother Lt. General Surindar Nath Sharma retired as Engineer-in-chief (Army), while the youngest brother General Vishwa Nath Sharma ( PVSM, AVSM, ADC) retired as the 15th Chief of Army Staff of the Indian Army(1988–1990). His sister Major Kamla Tewari was a Doctor in the Medical Corps. His maternal uncle Captain Krishna Dutt Vasudeva of the 19th Hyderabad Regiment had died defending a bridge on the River Slim in Malaya against the Japanese. His bravery had made it possible for hundreds of his jawans to cross over to safety. Hailing from a family with such a distinguished military background, it was only natural that after finishing his schooling at Sherwood College, he was motivated to enrol at the Prince of Wales Royal Military College in Dehra Dun and thereafter joined the Royal Military Academy. Upon successful graduation, he was commissioned as a Lieutenant into the 8th Battalion, 19th Hyderabad Regiment (later 4th Battalion, Kumaon Regiment) Indian Army (then British Indian Army) on 22 February 1942. He got a first taste of actual combat during the second World War in the Arakan Theatre of Operations on the Burmese Front against the Japanese. During this period, his battalion was under the command of Colonel K S Thimmayya (later the army chief). The following anecdote speaks volumes about the character of the young officer. Somnath retorted, ‘Sir, it is my own orderly that I am carrying; he is badly wounded and bleeding, l will not leave him behind.’ He eventually managed to carry Bahadur back, saving his life. Having fought bravely he earned several Mentioned-in-Dispatches and commendations from the Army HQ. On 22 October 1947, Pakistan launched the tribal invasion of Jammu & Kashmir. The intention was to grab the Kashmir valley by force. As the State became a part of the Union on October 26th, her protection became the responsibility of India. To save the State from a tribal invasion, which was approaching the valley at a very fast pace, India dispatched troops to Srinagar. The first batch of Indian troops reached just in time on October 27th morning to stop the enemy on the outskirts of Srinagar. The D Company of 4 Kumaon, led by Major Somnath Sharma, was airlifted to Srinagar on October 31st. When his company was asked to move to Srinagar, Major Sharma’s arm was in plaster. He had suffered a fracture and was advised rest till the plaster was removed. Though technically ‘unfit for active duty in war’, he insisted that he had to lead his company at this crucial juncture and was ultimately allowed to go by the commanding officer. Meanwhile, the main thrust of the tribal invasion of Srinagar had been blunted by the 1 Sikh at Patan. The enemy now resorted to guerrilla tactics to sneak into the valley. But the induction of more troops into Srinagar enabled the Army to take care of the surrounding areas better. On November 3rd, a strong fighting patrol comprising 3 companies was dispatched to reconnoitre the Bagdam area to look for raiders approaching Srinagar from the northern direction. By 0930 hrs the troops had established a firm base at Bagdam. As no enemy was seen during patrolling, two companies moved back to Srinagar by 1400 hrs. D Coy led by Major Sharma which had taken up position south of Bagdam was, however, asked to stay on in the area till 1500 hours. At 1435 hours, D Coy was subjected to firing from some houses of Bagdam village. The Coy did not return fire for fear of killing innocent people of the village. While Major Sharma was discussing this threat with the Brigade Commander, a large force of the enemy, about 700 strong, appeared from a depression to the west of his position. It attacked the coy with small arms, mortars and heavy automatics. The accurate and devastating fire of the enemy inflicted heavy casualties on D Coy. Major Somnath Sharma understood the gravity of the situation and the imminent threat to both Srinagar town and the airfield was looming large before his eyes. He rushed across the open ground to his sections, exposing himself to enemy fire. He also laid out panels to guide IAF aircraft to their targets in the face of enemy fire. The company held on for six hours against heavy odds. When heavy casualties adversely affected the firing power of the company, Major Sharma, with his right hand in plaster, took upon himself the task of filling the magazines and issuing them to men, operating light machine guns. While he was busy fighting the enemy, a mortar shell exploded on the ammunition near him resulting in an explosion that killed him. But this ultimate sacrifice of the Paramvir did not go in vain. His leadership, gallantry and tenacious defence were such that the remainder of his men were inspired to fight the enemy while being outnumbered by seven to one, six hours after this gallant officer had been killed. This resulted in the enemy being delayed for six hours, thus gaining time for our reinforcements to get into position at Hum Hom to stem the tide of the enemy advance. He has set an example of courage and qualities seldom equalled in the history of the Indian Army. The Param Vir Chakra is awarded for most conspicuous bravery or some daring or pre-eminent act of valour or self sacrifice, in the presence of the enemy, whether on land, at sea, or in the air. 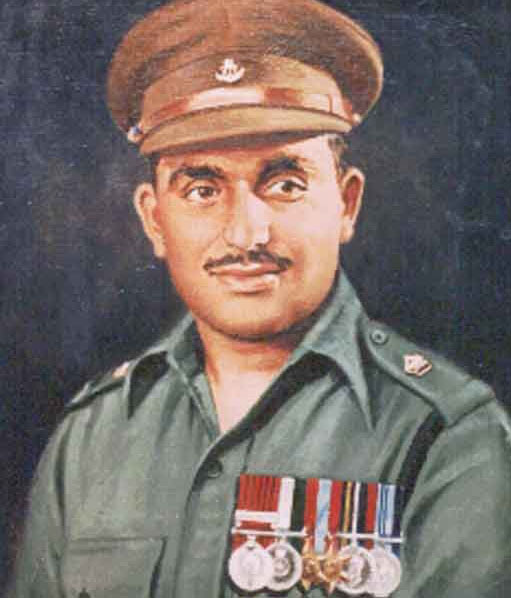 It is only befitting that Major Somnath Sharma was the first recipient of the most prestigious gallantry award of the land, and set the precedent that is still the popular lore within the army. TFI salutes this Hero of Heroes.